This week I felt rather frustrated with ISBN barcodes being placed right near the spot where we put library barcodes. During the book design process, maybe someone thought it was a good or handy spot if the book was being sold – easy to scan and get the cash! However, think of the library staff who need to add a barcode so the item is trackable for their collection. Every time you try and scan it with the barcode wand, it picks up the ISBN barcode. 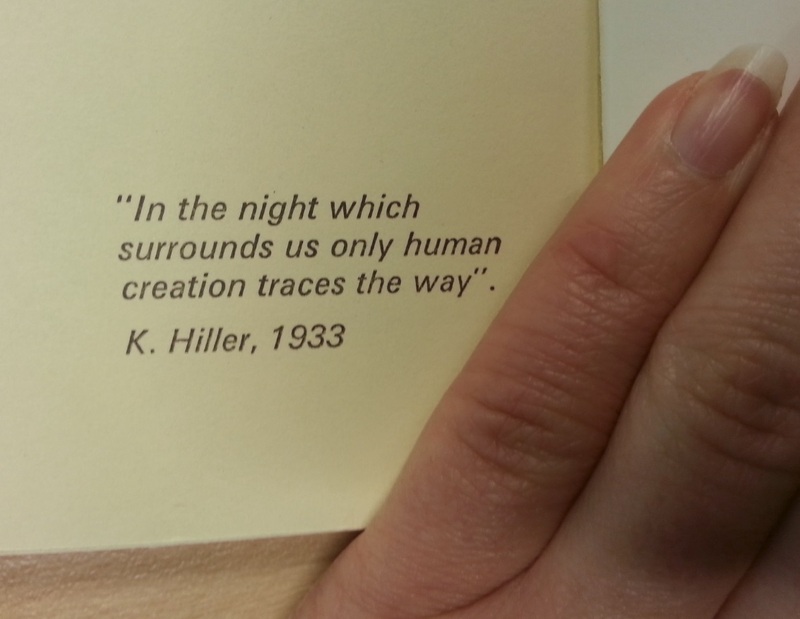 In the midst of being annoyed – and I know it sounds petty, it’s just tedious as it happens a lot – I found this lovely quote from Karol Hiller in the usual barcoding area. Karol Hiller was a Polish artist in the 30s who invented heliographs, or “picture writing”. A negative (heliographic plate, originally glass and then transparent celluloid) is prepared with chemicals, powders and other materials for different textural effects. The plate is then exposed to light, if this is then pressed to sensitive paper, it provides a source of almost endless prints of the image (see Nakov’s essay for further details). I’m glad of having a nice surprise at opening a book instead of having the wrong barcode disrupt my enjoyment. Collages and reliefs: 1910-1945, essay by Jane Beckett and Hiller-heliographs, essay by Andrei Nakov. London: Annely Juda Fine Art, 1982. I like the connection you’ve made, I guess some human creation is better than others. I also don’t like the often terrible clash of ISBN and barcode! But I also find that too often something important is covered by the library barcode because that’s where it’s got to go. Wouldn’t it be great if publishers and librarians recognised this problem and worked out to quarantine some space in recognition of libraries requirements.